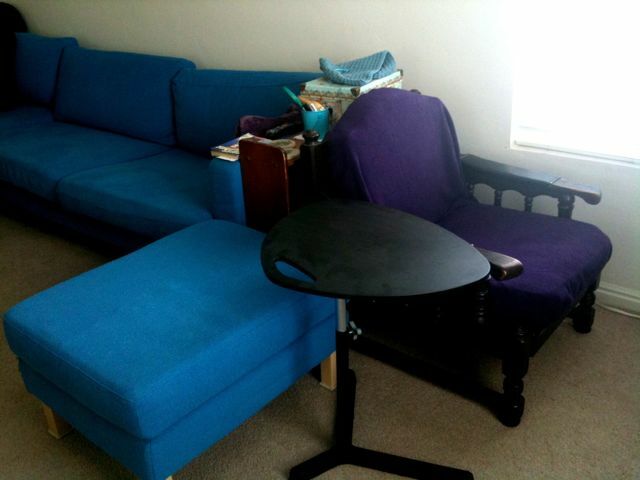 I was thinking about buying an Ikea chair to match the couch and sit by the window. I knew it would fit, but I didn’t know if it would look good or feel comfortable. Instead of buying the chair and finding out it was bad, I moved my comfy chair from my office into the spot. Ironically, it DOES feel uncomfortable, but not for the reasons I imagined. Because the chair is facing the china cabinet, I can see a constant reflection of myself in its glass. 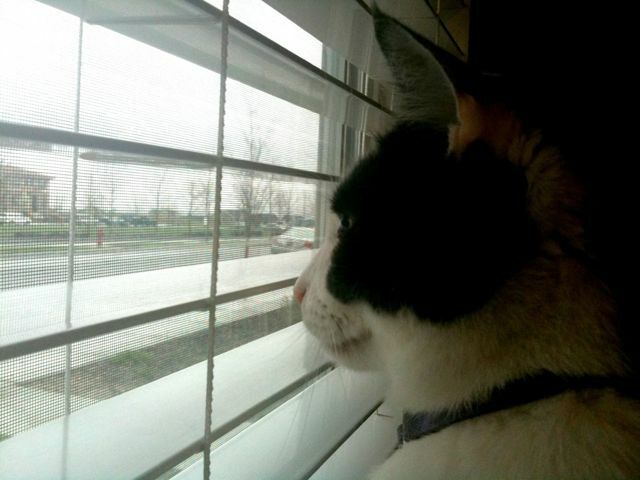 Rather than enjoying the view, I find my gaze drawn to the vision of myself staring back. I think I’ll move the chair back and give up on the idea of sitting next to the window. I was cleaning off the kitchen table, gathering dishes from this morning’s breakfast. My hand hit the back of a chair and I dropped a glass. This is not a new occurence. I drop a glass every couple of days or so, but they usually bounce on the carpeted floor and the worst I can complain about is the liquid that threatens to stain the carpet. Today, however, the glass shattered. I realized, as I picked up the shards, that it was a McCullough’s glass. 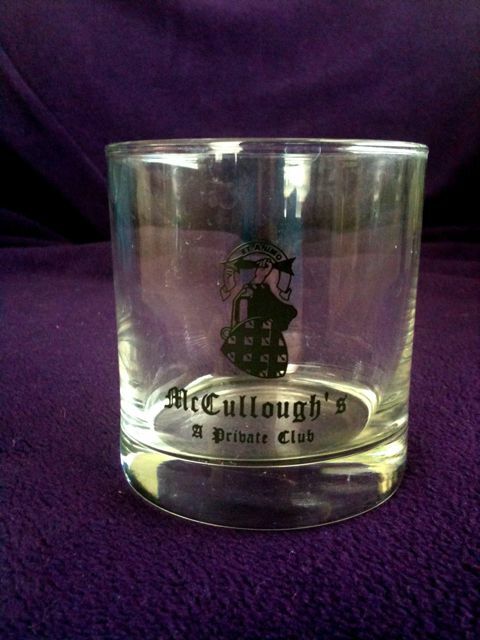 I had won these glasses from McCullough’s one night, but I can’t remember what I did to win them. A sick panic washed over me as I picked up the sharp pieces of my past. Did I still have the other one or had I broken it as well? I rushed to the cabinet and pushed aside the cups and glasses until I found it: my last remaining vestige of McCullough’s. After The Ritz closed, we mourned. It reopened as McCullough’s Private Club. It was there that Mike and I first fell in love with darts. It wasn’t quite like The Ritz, but it was good enough. We went there with my sister Stacey many times before it finally closed as well. The only thing I have reminding me of those days is this lone McCullough’s glass, in mourning over the loss of its partner. Just a quick note to wish you all a Happy Easter! I found this old postcard in a used bookstore last year, so I scanned it in for everyone to enjoy! The postcard was addressed to a Miss Gladys Kleine in Ashville, New York and sent on April 9, 1909. It feels so weird to have a hundred year old document in my hands. The two of them must have seen each other regularly because the card is so simple. Miss Seekins didn’t feel necessary to fill the postcard with updates about her life, so I suspect that she and Miss Gladys lived nearby. 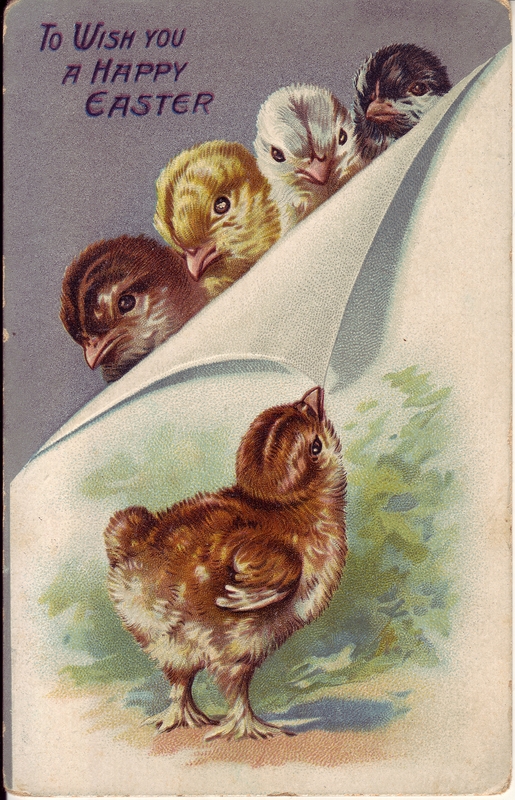 The postcard is embossed with the image, so the chick and even the letters to the words, “TO WISH YOU A HAPPY EASTER,” are raised and I can feel them with my fingertips. 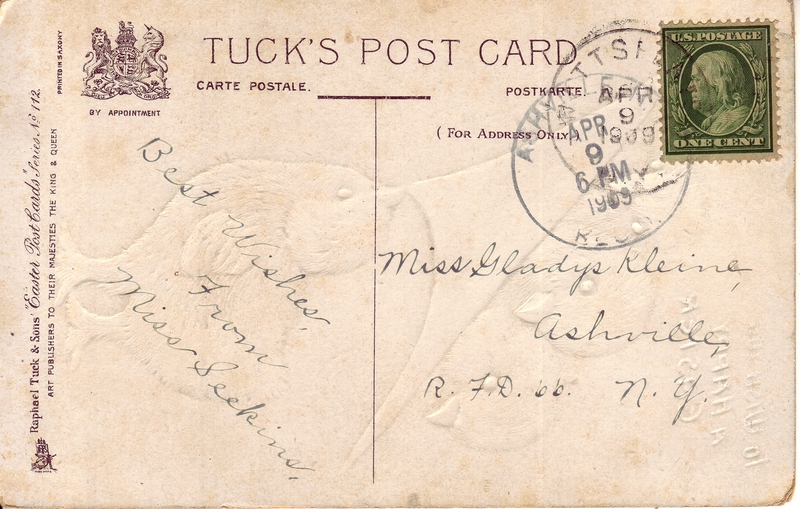 You can actually see the embossing on the letter side of the postcard if you look hard enough. 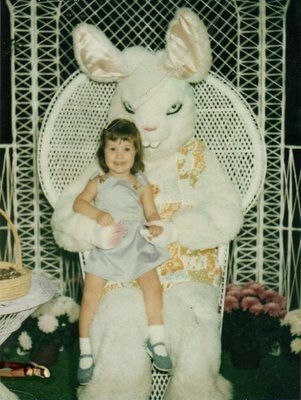 When Meredith submitted her childhood Easter Bunny photo to Awkward Family Photos, she probably never realized that she would be haunting the world with its creepiness. 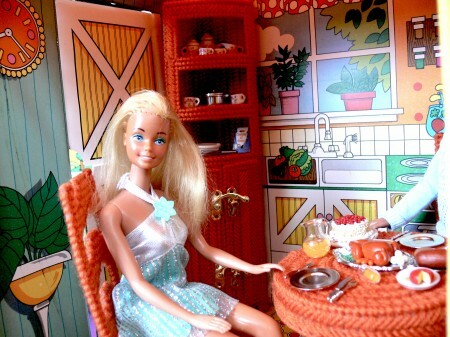 I’ve been making plastic canvas furniture for the Barbie Country Living Home I found at ThriftTown back in February. I kind of had to make a pattern myself to match the original furniture. Plus, the kitchen needed some storage, so I made a hutch for it as well. Here’s a photo. I was browsing the dollhouse section at Hobby Lobby and I noticed that most of the accessories are sized for Barbie, not the traditional dollhouse scale (which is smaller). I absolutely LOVE the little forks, knives and spoons. I remember seeing little cutlery like that on Sesame Street when I was a kid and wished I could have something like that for my Barbies. Why did it take me so long to find them? 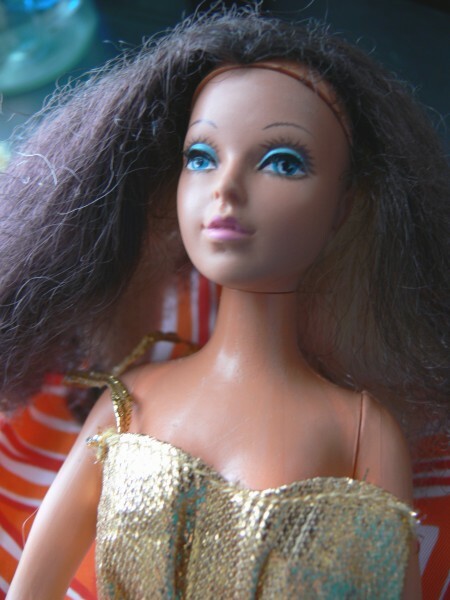 This is my first real Barbie. 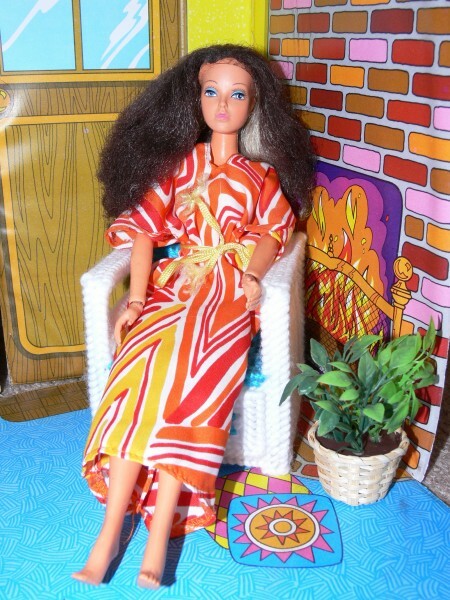 I had a Skipper before this doll, but this was my first Barbie. I used to think that she was a Malibu Barbie, but her face doesn’t look right. I am so sad that her hair is thinning. I brushed it a lot and stuffed it into so many ponytails that it’s kind of ruined forever. On the plus side, the new Barbie clothes fit her better than her counterparts from the Eighties. The toy we inherited from the previous homeowners wasn’t complete. We only had one of the panels to the ski jump, but it wasn’t long enough to even reach the floor in a vertical drop. Stacey and I used to prop it up on the huge dictionaries from Mom’s bookcase. There was no Olympic Gold Medal to award Barbie, either. The “swirling snow saucer” was missing as well. 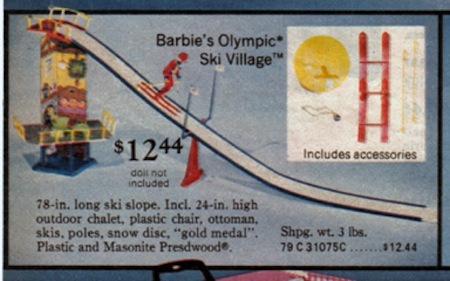 Thirty years later, all that remains of the Barbie Olympic Ski Village are a pair of skis. 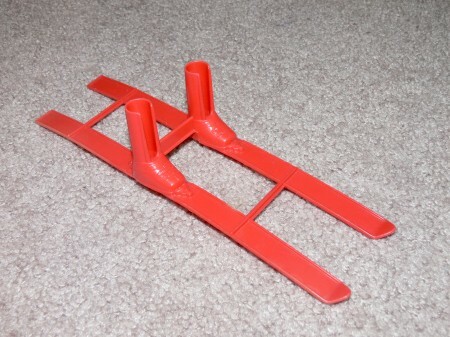 You would think that living in Salt Lake City, Utah, I would have been a mad for skiing kid and loved this toy, but I didn’t. Skiing was something rich people did. They invaded our town and wasted their time strapping boards to their feet and falling down hills. This toy kind of sat in disrepair, virtually unplayed with until it was finally thrown away. It makes me kind of sad for it. Maybe it ended up on the Island of Misfit Toys and found a place where it could be happy. Although her hair is a matted mess of unbrushable fluff, my Tuesday Taylor doll is still awesome. This is Suntan Tuesday Taylor, meaning that she could actually get a TAN in the SUN! My friends were amazed at her. Here’s a commercial showing off her suntanning glory. 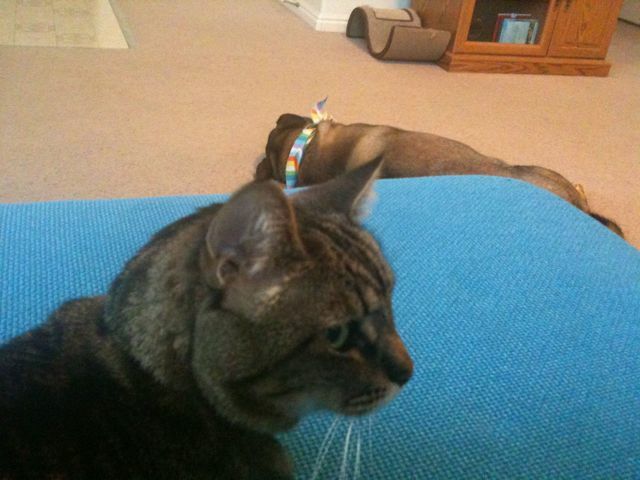 After seeing this commercial, I decided to let Tuesday go out for a tan, even though it’s so very bad for her health. 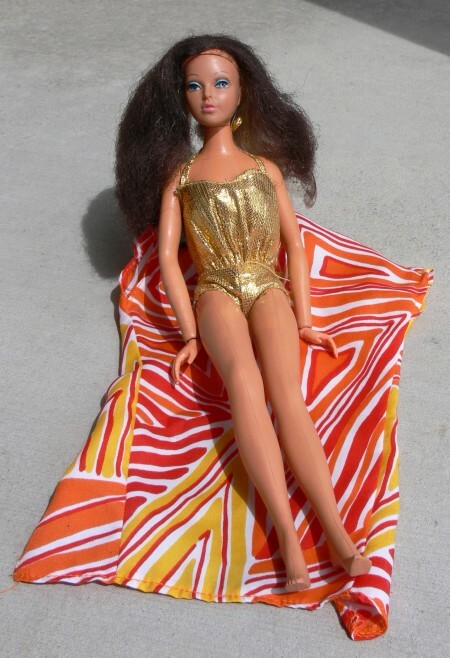 She borrowed Golden Dream Barbie’s swimming suit. I even put a jewel sticker on her leg to see if there was a difference after a bit in the sun. After about thirty minutes in the sun, there is a slight difference in skin tone, but you can only see it if you’re looking closely. What was more surprising are the tan lines on her shoulders. They were far more obvious. I was impressed how well that worked. I fully expected no effect. When I saw the tan lines on her shoulders, I felt just as awed and happy as I was when I was a child. This toy is thirty years old and she still works just as well as she did when she was new. It’s nice to know that Tuesday Taylor is still awesome. Sometimes I’m shocked at how intact my toys are. 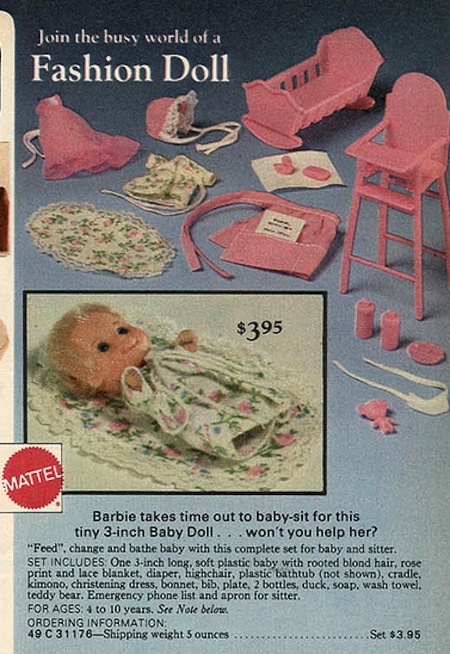 I found this Babysitting Barbie set in the 1977 Sears Christmas Catalog on Flickr. I was able to find almost all of the pieces to the set (and a couple of spoons to feed the baby that must have come from some other set). I’m surprised how good the baby still looks today. After thirty years, you’d think she would show a little wear. My nieces came over to play at my house a couple of weeks ago. I let them play with my Barbies and they absolutely LOVED the baby Barbie and her accessories. I remember feeling like that. 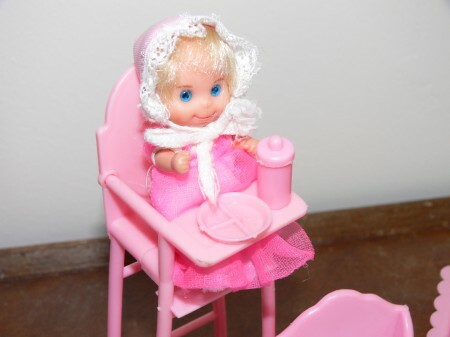 The baby Barbies and even Skipper were dolls that were rare compared to the vast quantities of Barbies available, so they were cool. They were like Barbies, but the wrong size. Watching my nieces playing with my old Barbies made me so happy. 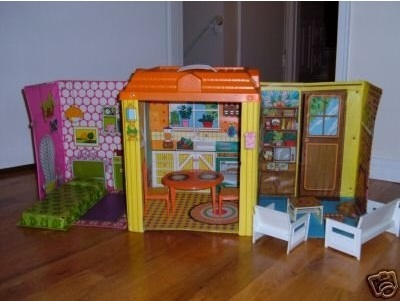 Isn’t funny to know that even though a toy is thirty years old, it can still be fun for kids. Happy Happy Birthday To Me!! 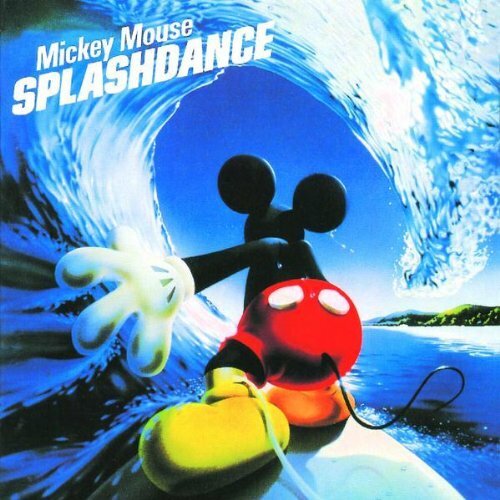 Every year for my birthday, I think of this song from Mickey Mouse’s Splashdance album. I bought the album for my sister for her birthday in 1983, but it was truly a gift for both of us. I was in junior high by then, so an album with Mickey Mouse on the jacket was too juvenile for me… or at least that’s what I would have said back then. I didn’t want to admit how much I loved that album. Stacey and I played it so many times that I can still sing all the songs by heart. Back in December, I found Splashdance on Amazon’s MP3 downloads and you would think that I had found pure gold. I was so happy to be able to listen to that album again!